If you’re searching for dependable Burke lawn service, have a look around the Complete Lawn website. 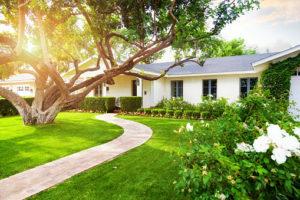 Complete Lawn has been providing comprehensive lawn services with a professional design and personal touch to Burke and other Northern Virginia residents for over 40 years. Our professional, courteous team uses the finest quality materials and brings a wealth of knowledge and experience to design and construct an outdoor space that will beautify and add value to your home. Lawn Care. We provide a complete mowing service, including maintaining proper grass height, bagging and recycling grass and blowing off debris. Our seed and feed service can get insects under control and help maintain high quality soil and fertilization. We also offer several shrub and bed care programs that include plant care, bed detailing and shrub and tree trimming. Landscaping. We offer a complete landscape and hardscape design that includes drainage services and adds to the beauty and functionality of your outdoor space. From well-placed and healthy plants to driveways and retaining walls, we’ll design an ideal space for your business or residential needs. Irrigation. Our team includes a Certified Irrigation Designer who can examine your lawn and determine your irrigation needs. We’ll design a custom automatic sprinkler system with state-of-the-art components that will efficiently irrigate your landscape without wasting water. After installation, we will maintain and inspect your sprinkler system year-round. In addition to providing dependable Burke lawn service, we also offer mosquito control with environmentally friendly oils, and snow removal services to get you out from under those occasional Northern Virginia heavy snowfalls. Whatever the time of year, Complete Lawn get you outdoors and happy with your outdoor space. When you’re ready for a complimentary consultation, click on “Get A Price” and tell us about your project. Or give us a call today at (703) 560-5296. We’re looking forward to improving your outdoor space!